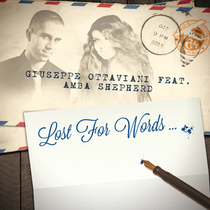 Hot off the back of his recent ‘Arcobaleno’ and ‘Falcons’ collaborations (which over the course of summer 2012 picked up Single of the Month awards in MIXMAG and DJ Mag), Giuseppe Ottaviani returns to solo production mode for his new single ‘Lost For Words’. On the Club and OnAir Mixes, Giuseppe spikes ‘Lost For Words’ with drums, plucked strings, synths and a full spectrum of other big room components. Amba Shepherd (whose recent studio work includes tracks with Porter Robinson and Ferry Corsten) adds her unique vocal inflexion, pitched perfectly between the points of lamentation and elevation. With Armin van Buuren all over the Giuseppe Ottaviani rework of Paul van Dyk Ft. Plumb’s ‘I Don’t Deserve You’, the trance DJ has been equally quick to embrace ‘Lost’, premiering it on ASOT 584. The single’s video is already racking up views at speed. With the harder, more grinding club rub from Judge Jules also marshalled for action, ‘Lost’ has all the makings of another decent release for Giuseppe’s discography. It’s out now.